Had to give a bit of a shout-out to Doug Gwosdz, a.k.a. “Eyechart,” a former big leaguer who didn’t quite crack the All-Time All-Doug All-Star lineup. 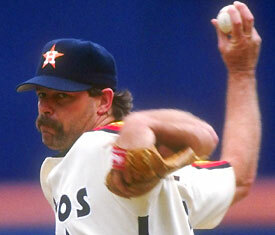 Same with Doug Bochtler. Sorry, fellas. It was tough. But, since we’re in a lineup kind of mood, how about this 1972 poetry book, which was re-issued recently? If you’ve somehow located this blog and made it this far, then you’ve probably seen Ken Burns’ “Baseball” and surely have heard over and over again about baseball as poetry. But this book really is baseball as poetry, or, more accurately, poetry as baseball. 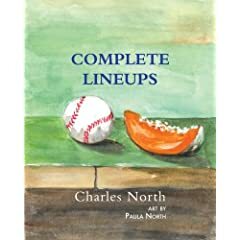 Charles North, the acclaimed American poet who has won the National Endowment for the Arts Creative Writing Fellowship twice, serves as the poet-in-residence at Pace University in New York City, and has published nine collections of poems and critical essays over the last 30 years, also happens to be a huge baseball fan. So he takes the classic (and not entirely poetic, but more on that later) form of the baseball lineup and assigns people, places and things what he feels to be their appropriate slots in a batting order along with positions in the field. As North explains, you, the reader, are free to decide what it all means. “I’m usually considered experimental, in one way or another, which means that on different levels, I’m fooling around and trying to break rules of one kind or another,” North says. “As a teacher, I encourage people to break ‘rules,’ with subject matter and forms and language. And that’s where I think the lineups fit in. Here’s a quick stab at a North-inspired lineup poem straight from Youneverknow to you. You get the idea? Comment and add your own. I’m sure Charles will be thrilled to see the many different ways to expand on his vision.